Years ago, something tragic happened in your life. You lost all of your teeth and since then, have felt incomplete. You definitely recognize their absence because you can’t eat what you used to, and you also have suffered from the drastic change in your appearance, as your face has begun to collapse. This has become unbearable for you to endure, which is why you’re now ready to make a change. There are two restorative methods that you’re considering, but you want to be sure that you’re fully informed. Learn from your dentist about the benefits of both dental implants and dentures of the Colony. What are the Benefits of Both Dental Implants of the Colony and Dentures? Just to give an overview, both dental implants and dentures provide support for your jawbone. This is of the utmost importance because missing teeth lead to bone degeneration over time, due to the fact that the jawbone and teeth exist in a symbiotic manner, where each root and crown structure is supporting the adjacent ones. This close proximity helps maintain a tension that sends a message to your jawbone to keep producing new bone cells. Thus, when you choose either dental implants or dentures, you are reinitiating that line of communication that is vital for maintaining your oral health. Durability – One of the big advantages of dental implants is their durable construction from titanium that replaces missing roots. Once healed, they also function as secure bases for your crowns, bridges and implant-supported dentures. Function – Dental implants also allow you to regain the normal function of your teeth, allowing you to eat and drink as normal. Appearance – With your new implants, you will regain the look that you’ve been missing for so many years, as you’ll have a natural, yet perfect smile. Maintenance – Another perk of dental implants, is that you can clean them just like normal teeth. Cost – A major benefit of removable dentures is that they are typically a less expensive option to restore your smile. Less Invasive – Another attraction for them is that they don’t require an invasive procedure to wear them, which means you can restore your missing teeth fast. Accommodates Bone Loss – For some people who have suffered bone loss, dental implants are not an option. 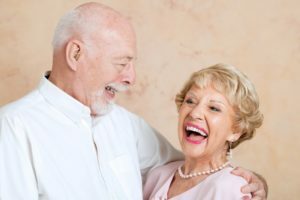 For them, dentures offer a way to still restore their smile and protect their jawbone from further degeneration. Whether you choose dentures or dental implants, your dentist in the Colony can help you restore your way of life, self-esteem and function. The key is just to take the initial step and start the journey by making an initial call for a consultation. Dr. Austin Amos earned his undergraduate degree from Austin College and then went on to receive his Doctor of Dental Surgery degree from the University of Texas School of Dentistry. A member of the American Dental Association, he stays abreast of the latest advances in dentistry through continuing education. He practices at Ridgepointe Dental and can be reached for more information through his website.